Dont miss the chance to visit Chichen Itza, the most important archaeological zone in Yucatan and one of the new world wonders and get amazed by the Light & Sound Show hosted by the ancient spirits that captivate your eyes and soul. You will witness a representation of the equinox, the southward movement of the Kukulcan feathered serpent by multicolored lights. Suddenly you will live some flashbacks to the ancient Mayan world through a narrative that goes perfectly with the special effects of light and sound. You will understand much better a history that has enriched Mexican culture since the beginning. Our excursion begins picking up all the passengers from 11:00 am to 1:00 pm at the lobby of all major hotels from Cancun to Playa del Carmen. We will arrive at Chichen Itza Mayan Ruins approximately at 3:00 PM. 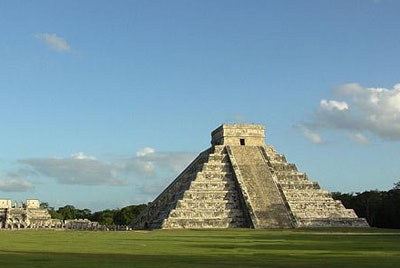 You will be taken on a 1.5 hour tour with a certified guide who will introduce you to the secrets of the Mayans. Your guide will explain the historical significance of all the most important sites before leaving you to enjoy the ruins on your own. After the guided visit we will enjoy a delicious dinner a la carte. Certified bilingual guide at archaeological site. Due to the presence of rain we are exposed to the suspension of the 3D projection on the Kukulcán pyramid, this being not an impediment to carry out the rest of the tour, in case the authorities decide to cancel the projection, will be applied a partial refund of 20 %. Extra cash for shopping, beverages, etc. Pick up is available for most hotels located from Cancun to Playa del Carmen. Exact time of your pick-up will be sent by email after booking.